Both sides get primed, just to be sure it stays straight and it is water proof. The primer including 0,1-0,3mm quartz sand for better adhesion. All the ingredients for mixing together. First layer of concreet (beton cire). It looks kind of concrete grey but its not. 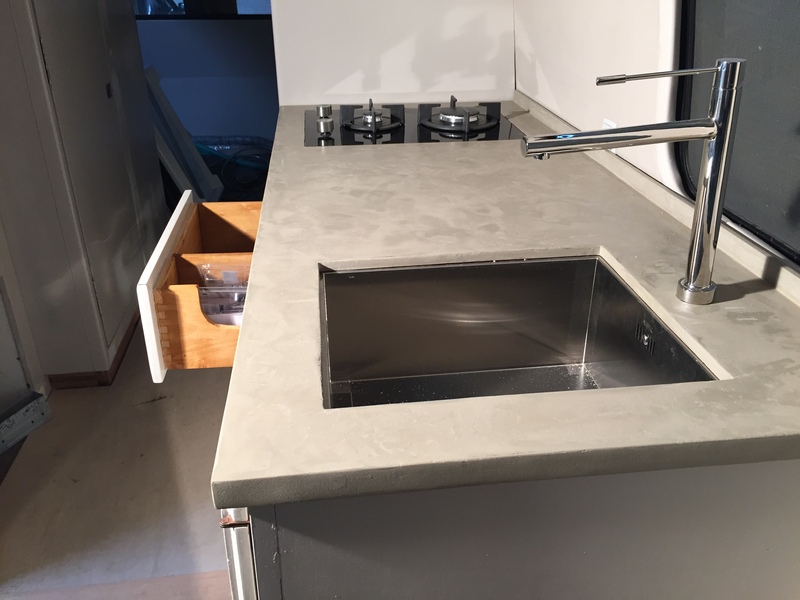 The countertop – 2 Burner stove on the left and a deep sink on the right and a little skirting. After the sanding. It starting to look like the look I am after…. The color is getting closer. It will be fine after the protection coating layers. The final stage is putting the protecting coating A and B on and then have it dry for 4 days. It looks great but the layer is a bit thin so in some cases you see right threw. (Oeps). But surely a Sharpy can fix this. In a couple of years we might want to add a new layer but for now …. were done…. and this is it. Fantastic job. where did you get the oven & 2-burner stove top? Hi Greg, Thank you for the compliment! I updated the Material section were all the items are listed. The 2-burner gas stove is from Boretti. I got it online from a campingstore in Holland named De Wit in Schijndel. Hope this helps.